Sometimes it feels like the world is slowly moving away from good old mechanical things. For example, when was the last time you cranked an actual music box? Joelle Aeschlimann from ECAL probably felt the same way when she created this extremely cool music box prototype for the iPad. 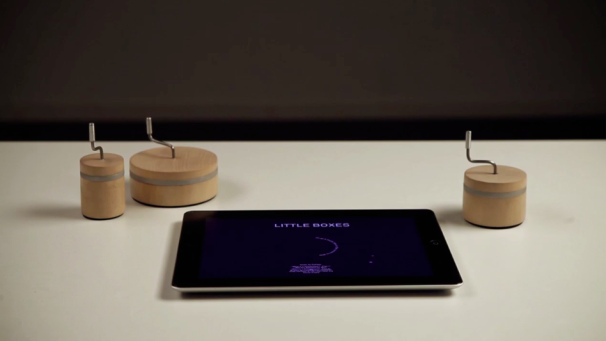 While it doesn’t work on pure mechanical principals, the music box is built to interact with a special Adobe Air app on the iPad, and produce music and patterns when you turn the lever. So how exactly does this magic work? The prototype set includes three boxes of different sizes. According to Creative Applications, The bottom of each box contains two rubber tips that come off commercial styluses, and supply the conductive material needed to interact with the iPad’s touchscreen. The space between these two tips is different for each box, which allows the app to recognize which box is being used. When you crank the lever, the bottom part starts rotating. This movement plus the box’s location on the screen, trigger matching music and visual patterns, which almost sound like a real music box playing. The best part about this music box is watching it in action. While there’s no lack of music apps for the iPad, there’s nothing like the feeling of producing it yourself by turning an actual lever. All you have to do is close your eyes and imagine it’s real. Little Boxes ECAL/Joelle Aeschlimann from ECAL on Vimeo.